Oh Hail! Where’s That Cockpit Weather When You Need It? As the old saying goes, in so many ways, a picture speaks a thousand words. By now you have probably seen the chilling photo like the one shown in this media report of Delta Flight 1889 parked safely at the gate after diverting to Denver International Airport. This was the result of a nasty encounter with hail at 34,000 feet while en route from Boston to Salt Lake City last Friday evening. It makes little sense with today’s proven technology that any commercial aircraft should ever encounter such a hazardous situation and risk the lives of those on board. The crew of this Airbus A320 did an admirable job getting the aircraft safely on the ground after this encounter, but there’s another side to the story that got them into trouble in the first place. A few simple pictures in the cockpit may have made all the difference in the world to avoid putting these passengers through such a harrowing experience. It’s truly a shame that a pilot flying a single engine Cessna 172 can have significantly more weather information available to them in the cockpit than the crew of this A320 had. We woulda, coulda, shoulda this crew’s decision to fly into this developing area of convection, but that’s not the point. The simple fact is, aircrews flying paying customers today are not equipped with matured technology that will provide them with valuable weather data to make timely decisions during any phase of flight to avoid these kinds of encounters. Sure, these aircraft are equipped with onboard radar and the crews they carry are highly trained and experienced pilots who know how to make use of that radar. Even when properly used, onboard radar has limitations. It is a real-time snapshot of what’s occurring right now out in front of the aircraft, and this is critical data for tactical decisions, but is simply a microcosm of the overall energy in the atmosphere. In events like this, it is the macro picture of what’s unfolding 100 or more miles away that is often just as important. This large-scale view is better suited to help make the proper strategic decisions, especially when it comes to a developing area of severe thunderstorms. But that information needs to get to the pilot-in-command. Air crews can and do get help from air traffic controllers. Controllers can tout about a “hole” that the last five aircraft recently traversed. But that doesn’t necessarily tell you how fast that hole is closing up and whether or not it will still be there when you arrive. The crew may also have access to their company’s dispatchers, but in the end, the captain may not have the complete picture in his or her head…and that’s where these strategic decisions are made. This color-enhanced infrared satellite image (also available in ForeFlight Mobile) valid at 0045 UTC shows two distinct areas of convection. Dark purple and white areas denote very cold cloud tops likely from strong updrafts. Flight path of Delta 1889 taken from Flightaware is shown in black. Even before Delta Flight 1889 departed Boston’s Logan Airport, two areas of convection started to blossom in Colorado, one in northeast Colorado and the other in southeast Colorado. At 0045 UTC, you can see two distinct systems on the color-enhanced infrared satellite image shown above. As the Airbus crossed over the Mississippi River (black line is the aircraft’s approximate track taken from Flightaware) around the time this satellite image was taken, both areas of thunderstorms had been designated as severe. Nevertheless, there’s clearly a gap between these two convective systems and that appears to be where the crew was headed. This color-enhanced infrared satellite image valid at 0115 UTC shows the gap between these two areas of convection beginning to quickly fill in with a rapidly developing line of severe thunderstorms. By 0115Z, that severe line of thunderstorms to the south moved into western Kansas. 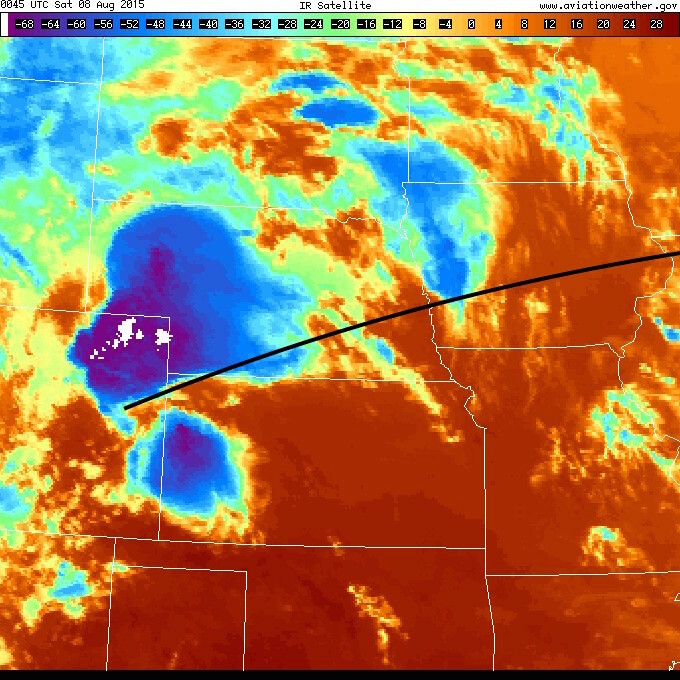 A line of storms developed on the northern extent of this area of severe thunderstorms bridging the gap shown very clearly in the infrared satellite image above. At this point the flight was still in southwest Iowa just about to cross the Nebraska State line. Even if this image didn’t become available for at least 15 to 20 minutes later at 0130Z, it was plenty of time to notice this explosive area of convection was quickly filling this gap. 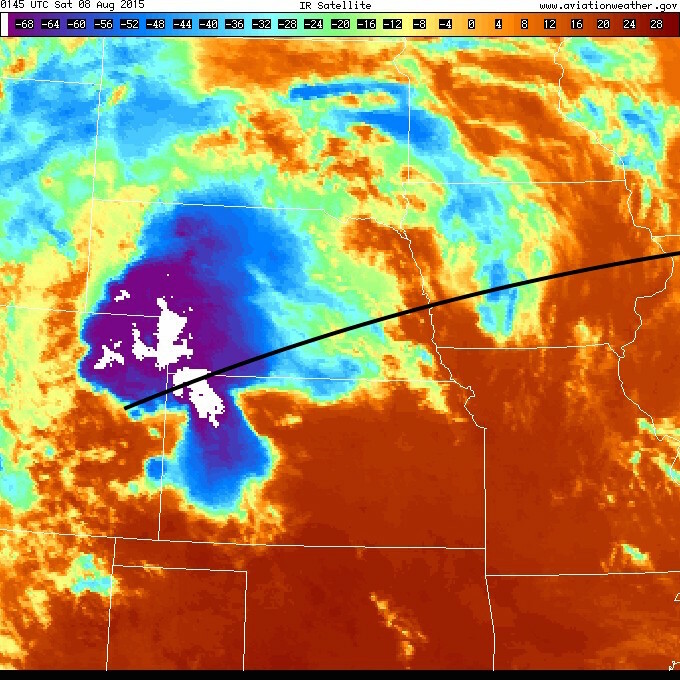 About 20 minutes before Delta Flight 1889 penetrated this line of storms, the gap had completely closed with the color-enhanced infrared satellite image showing very cold (high) cloud tops along the route of flight. About 20 minutes before the crew diverted to Denver at 0205 UTC, the image above shows the gap is now completely gone as these two areas of severe convection continue to mature and merge into one mesoscale convective system (MCS). Unfortunately, the crew of this Airbus A320 did not have access to critical weather data such as this. A simple three hour loop of this color-enhanced infrared satellite image could have given the pilots enough information to recognize the gap was closing and choose a better route to prevent this kind of encounter from occurring. The local ground-based NEXRAD that is updated every five minutes had even more details that might have suggested the gap would quickly disappear. Once again, this kind of strategic weather information is not available in the cockpit of these aircraft. The 2.5 hour 0.5 degree base reflectivity loop shown below is from the Goodland, Kansas WSR-88D NEXRAD Doppler radar. The loop ends right about the time the crew diverted to Denver, shortly after being pelted by hail. This is a loop of the 0.5 degree base reflectivity out of Goodland, Kansas. This loop shows how the gap between these two convective systems begins to quickly disappear. Radar site is in the center of this image. Source: UCAR. This is a perfect description of what transpires next. 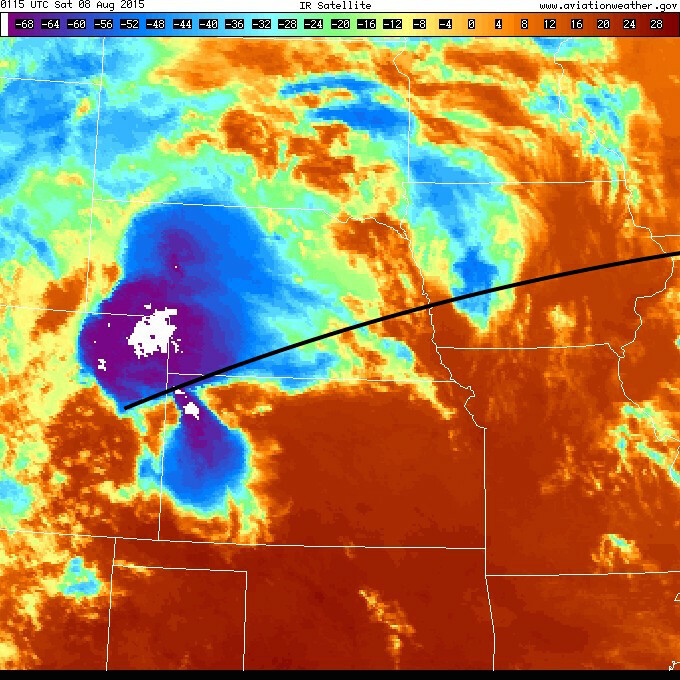 This boundary continues to push north-northeast and helps to initiate a new line of thunderstorms that rapidly blossoms into a convective barrier in extreme southwest Nebraska leaving the crew little choice but to use their onboard radar to tactically locate and penetrate the “softest” part of this line. The crew of this Airbus didn’t have any ground-based radar loop such as this available to them in the cockpit. Even so, most of the in-cockpit radar mosaics that general aviation pilots use every day is a volume product constructed from a composite of all elevation angles of the radar. Composite reflectivity tends to mask out important details such as these outflow boundaries. Unfortunately, most in-cockpit weather providers have chosen not to broadcast the 0.5 degree base reflectivity product like the one shown above. This includes the radar mosaic that can be received through the FIS-B (ADS-B) broadcast with Stratus or through the Baron Mobile Link for XM-delivered satellite weather. Vertically integrated liquid or VIL is another volume product that can show the truly nasty part of the storm. This loop clearly shows how quickly the gap disappeared between these two convective areas. Source: Plymouth State Weather Center. Furthermore, there are other NEXRAD products that can be very useful in flight. This includes another volume product called vertically integrated liquid (VIL) shown above. As mentioned earlier, composite reflectivity looks at all elevation angles of the radar for a particular volume scan and shows the highest reflectivity return in the column. VIL is similar, but is a summation of the reflectivity in the column. VIL is often an indicator of the storms’s updraft strength and has a strong link to observed hail size. 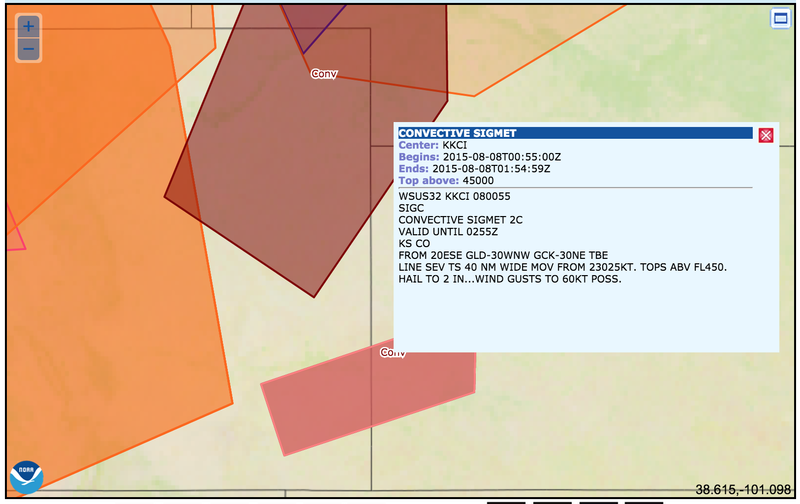 At 0055 UTC, two convective SIGMETs were active each describing an area or line of severe thunderstorms. Source: NOAA. You might say hindsight is 20/20, but this isn’t about second guessing a pilot’s decision. Instead, it’s a plea that aircrews should have more information available to them to make better informed decisions. There’s no doubt this was a risky choice; not only a risk of hail damage, but the threat of dangerous convective turbulence. The weather on both sides of the flight path consisted of severe thunderstorms. 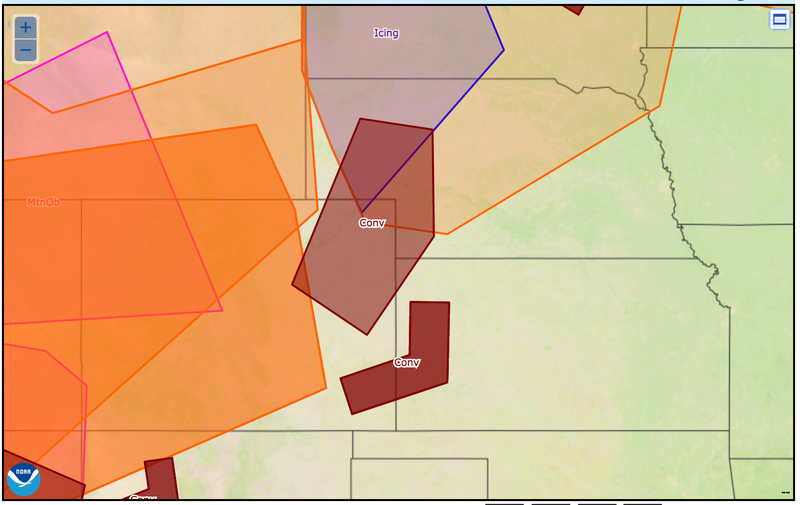 At 0055 UTC, the Aviation Weather Center (AWC) had issued two convective SIGMETs (WSTs) covering both areas of severe thunderstorms. Whether thunderstorms are severe or not is determined by the local weather forecast offices, but was echoed in the text of these convective SIGMETs. Both advisories suggested the potential for hail up to 2 inches in diameter as shown below. The southern most convective SIGMET was issued for a line of severe thunderstorms with hail up to 2 inches in diameter with tops above FL450. Source: NOAA. It’s time to start requiring commercial aircraft to have unlimited access to weather information in the cockpit – more than just onboard radar. Many aircraft equipped with Wi-Fi could easily connect to any number of ground-based weather sources and display it on a mobile device such as an iPad. Even with a device like a Stratus, the FIS-B data broadcast is still lagging way behind the available technology. So it’s time to start providing pilots with more than just basic weather data that mimics the heavy textual weather of the 1980s. There’s no doubt that getting more graphical weather data in the cockpit along with some focused training will keep professional aircrews from flying blindly into a hailstorm. Fortunately for those on board Delta Flight 1889, this flight ended well. However, right now airlines are stuck in this information-age purgatory. Is this due to cost? Probably, but there’s no encouragement by the FAA for airlines to equip pilots with this potentially live-saving guidance. This encounter should be a wakeup call to those stakeholders in aviation safety to allow, if not require, pilots to have unfettered access in the cockpit to whatever weather data is necessary to make every flight an uneventful one. What is it going to take to make this happen? Hopefully it will not be an event that has a tragic ending. But that’s usually the way it works.